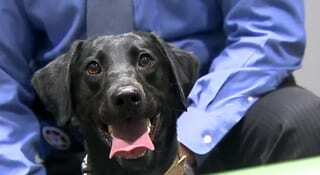 FRANKLIN, Tenn. – There are bomb-sniffing dogs, drug-sniffing dogs, and law enforcement in Williamson County recently added an electronics-sniffing dog named Remi. “It happens in every country, every state, every county, every city,” Detective Lee Eaves of the Williamson County Sheriff’s Office said. The files are stored on memory cards, flash drives, and many other devices, and while law enforcement can find a lot of those devices through their searches, sometimes they need help, and that’s where 2-year-old Remi comes in. Remi is the newest K-9 in Williamson County, and she has no trouble tracking those electronics down. She’s been trained to sniff out a special adhesive and flame-retardant chemical used on electronics, and she’s the first K-9 in Tennessee law enforcement that has been trained to do so. Remi was donated to the Williamson County Sheriff’s Office by Nashville K-9, a group that trains hundreds of police dogs every year, and they say dogs have skills that humans can’t possess. “A lot of times when we do these child exploitation warrants and we’re out there at these homes, there are children there, and having her there to comfort those children that are in need is very important,” Eaves said. Remi hasn’t been sent out in the field for an official Williamson County Sheriff’s Office mission yet, but Eaves said she’s ready to go when the occasion arises.